Pianist Damien DelRusso has spent 30 years in the music business. His second passion is his work as piano tuner. Together with his wife Nancy, a singer, he entertains the audience with a repertoire of more than one thousand songs from Billy Joel to the Beatles. 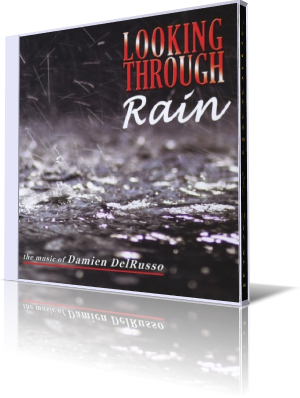 Looking Through Rain (2010) is Damien's debut album, available at CDBaby, Amazon and iTunes. Damien is suffering from RP (retinitis pigmentosa). This has caused him to lose most of his eyesight. So everything is for him like Looking Through Rain. $1.00 from the sale of each CD will go to the Foundation Fighting Blindness. So to buy this album isn't only a personal pleasure but also a social act. Damien is joined on this album by Matt King on keyboards, Dave Mann on sax, Rob Reich on guitar, Brian Killeen on bass, Josh Dion on drums, Café on percussion and singer Veronica Martell. Top-notch musicians with the guarantee for good music. With the title song Damien DelRusso combines the message that a musician can succeed even with a massive handicap. The song features sax player Dave Mann (Tower of Power) and guitar hero Rob Reich in prominent exposure. The emotional impact is Damien's signature sound. He composed all songs of this impressing album. Who could better perform these songs than David Mann on his sax. Island of Love is a good example for this intuition. Taking A Break showcases Matt King's elegant touch on keyboards. Matt co-produced and co-arranged the album with Damien and is the soul of this album. Josh Dion sings the bluesy ballade Ain't Doin It With You with his own twist. Josh has founded the Josh Dion Band with several longtime friends who studied with him at William Paterson University in New Jersey and already released three albums with that formation. Friends of the Hammond B3 sound will love the retro feeling of Pleasure Your Lover. Matt King pulls all registers of groove. On the appealing Good Times In The City guitarist Rob Reich stands in the limelight. If your are searching for a wedding song, the romantic Thinking Of You could be your choice. Saxophonist Dave Mann in a surprising cozy attitude. There are more flashbacks on this album like Each Time I Look At You featuring good looking singer Veronica Martell. Damien's compositions are stylish like the songs of Burt Bacharach. As placeholder of the popular Bossa Nova sound presents Damien Taking Another Break. Always Listen To Your Heart is a further romantic creation. The final take on this album is the heartfelt Song For Steve featuring Matt King on grand piano. Damien has written this song for his brother Steve, who inspired him to learn to play the piano. There is much love in this album. All performing musicians were engaged to support Damien DelRusso's project and to produce his compositional ideas. With your purchase of this album you will help the Foundation Fighting Blindness and have as much pleasure as the musicians recording this awesome music.